A year or so back I began writing poetry. I haven’t done any expressive writing since my mid-teens, but though I enjoy my time with a camera, there’s a bunch of stuff that doesn’t lend itself to photography, plus I have the time now to learn a new skill. So I plunged ahead in a “guess or by golly” kind of way. I genuinely didn’t/don’t know what I’m doing. Mostly I’m trying to wrestle words into different forms, which is a more mathematical process than I imagined. Anyhow, there are people here that have way more ability, and experience, with language than I. So, partly I’m starting this thread to get feedback, but also for anyone else to share any short-form writing they might have done. within their nest a promise. Dogs play in the snow. soon there will be warmth for all. That’s my first go at Tanka form (five lines that don’t rhyme. First and fifth have five syllables, the others seven. The third line is pivotal, lines 1–3 give one image, 3–5 another. It’s simple and good for natural, descriptive material. The owl’s head spins wildly clockwise. He squints, rotates it widdershins. the owl’s head spins madly clockwise. He winks, rotates it widdershins. I’m drawn to triolets. They’re short, eight lines, but have a complex rhyme scheme and I like the repetition with minimal change. They seem to lend themselves to dreamscapes, which is what this is. Thanks AdeC, looking forward to your next pieces. 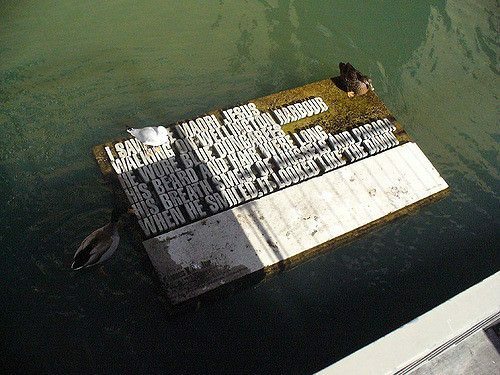 Didn't know what a Tanka was before either, I think I probably only know what a sonnet and a haiku are. Thanks. There are certainly far more forms than I realised a year ago. Like a box of candy, it's tempting to try them all right away, but I soon realised (as you may notice in up-coming posts!) that some don't treat the novice kindly. Good thread idea, AdC, although it has reminded me rather uncomfortably that I have forgotten pretty much anything ever previously learned about the technical side of poetry. Widdershins is a strong word and entirely new to me. It's excellent isn't it. My grandmother used it occasionally, in the sense of "the other way round" when I was putting a sweater on backwards or something. I've always interpreted it as meaning 'anticlockwise' (or 'counterclockwise' if you're westpondian), not simply the wrong way round or otherwise arse-backwards. On the other hand, I've always (at least, as long as I've known about them, which isn't all that long) interpreted tanka as just 'haiku on steroids' – that is, where the western idea of a haiku is three lines of 5-7-5 syllables, a tanka is 5-7-5-7-7. I've tried writing a few, basically thanks to the format allowing a bit more room for expression than the more constrained haiku form. However, the concept that you elucidate of the 'pivot' line joining two overlapping concepts is new to me, meaning my few efforts in this area probably need rewriting. ...unless the eagles are hunting the innocently playing dogs, which makes for a troubling but somehow satisfying twist on the idea...? I like too how you've composed 'Raptors' as a double-tanka, or pair of tangentially related tanka, which possibly doesn't fit the traditional format but hey, to hell with it. Ah good! That's exactly what I intended. There's an eagle's nest in the off-leash dog park where this is (sorta) set. I always worry about very small dogs that are allowed to run free. I don't know that it's actually happened but I always think of them as potential eagle "snack food." But you're right it's not super clear. Maybe "Small dogs in the snow," would be better? I do the same thing with triolets too sometimes. I don't see why not really, Thos. Hardy did it and I've been told not to be overly rigid with the rules. Last edited by Amor de Cosmos; 19-06-2018, 23:42. Yeah Once And Future, and Premonition Of Violence both seem to have the third line link. It's odd, but sometimes the form itself seems to want to make it happen. Not just with Tanka. I suspect — and I'm miles away from even dreaming about this — but if you internalise a form well enough I suspect the words will, sometimes, just fall into place. Thanks for posting. As I intimated up top I'm not sure I can judge my own efforts at all, I don't actually read much poetry — though I listen to a fair bit. But there's no real point in doing it unless you put it out there, and I do think this is a good place for honest judgement. Last edited by Amor de Cosmos; 20-06-2018, 05:49. I've spent my life mainly avoiding poetry, and have only very rarely have tried to write it since school. I didn't realise there were so many pre-set structures. Anyway, I just wanted to doff my hat in admiration to those of you posting your work on here. A few years back, in OTF's more brutal age, someone posted his poetry, asking for feedback. It got absolutely savaged from several angles and he took it back down again. I'm taking TS Eliot and Patrick Kavanagh away on holiday with me, though. I've decided that I ought to be paying poetry more attention. I like that a lot, by the way. IAnyway, I just wanted to doff my hat in admiration to those of you posting your work on here. A few years back, in OTF's more brutal age, someone posted his poetry, asking for feedback. It got absolutely savaged from several angles and he took it back down again. Yeah, that sort of thing inevitably crossed my mind when I was weighing up whether to post something. It still sarcastically says "New writers welcome... our sensitive audience would love to read excerpts from your manuscripts" on the description for the Books forum, after all. Figured I could get away with leaving 3 short things with a total 15 lines of non-personal sort of stuff, then run for the hills. Yeah. I certainly wouldn't have posted my own work here twenty years ago but we're all fair bit older now, more generous, more emotionally secure and... well, WTF eh? So here's a couple more. When I was twelve I won a school prize for a poem. I was kicked out of the same school later that year, which may represent some sort of record I suppose. Anyway the poem was a triolet about a giant one horned snail, and I really can't remember much else about it. But as a test of memory (and writing ability) I thought I dredge up whatever I could and reconstruct it. The original was only one stanza though, that I am sure of. a mammoth mollusk shadows us. a victim of the one-horned snail. ‘Tis a corpse encased in mucous! a mutant mollusk shadows us. don’t look around there is no time. Snail is deadly, though he ain’t quick. he can leap from trees — it’s no trick! snail is slippery, snail is slick. Don’t turn around. There is no time! Another tanka, built around dreams/memories about hitchhiking through Cornwall and the break-up with my first proper GF. but the pregnancy of loss. Magnificent mutant mollusc memories there Amor. 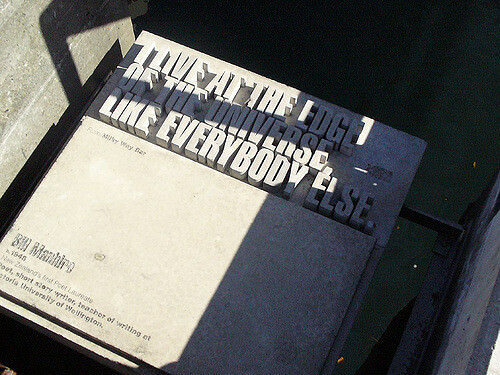 ...at which point the last two lines have to be rejigged somehow, or else it's quite a nice haiku left as it is. Maybe line 5 offers most obvious potential. It does make a nice haiku though, concentrates the colour and sensuality very well. Like imp I've always had a bit of a block with poetry; I've never in my life read poetry by choice, let alone attempted to create any. I managed during childhood and teens to attain a cynical, simplistic Poetry = Too Hard / Pretentious mindset, which sadly I've never gone back and fixed. So with that backcloth, I'd like to thank those who've contributed here and express my admiration for their work. I like some more than others but clearly (as above) am utterly unqualified to judge. But what is crystal clear is that it's a form which can lend itself to striking, impactful imagery in far fewer words than prose would need. AdC - I especially enjoyed Mousehole, having spent so much time in Cornwall in my earlier life; it's really evocative. Er, I found this so sensual I feel I'm intruding on your past. Seriously powerful. That line "the pregnancy of loss" is very powerful. I love poetic juxtaposition. I also really liked the owl one in the opening post. I wrote poetry back when I was depressed and on fluoxetine. I've never written in a non depressive state. Heh, thanks Sits, I think. I've never shared that one anywhere before, perhaps needless to say. what is crystal clear is that it's a form which can lend itself to striking, impactful imagery in far fewer words than prose would need. Oh, yes: this is the entire crux of the thing with poetry, for me, absolutely. That "pregnancy" line of AdeC's is a terrific example, for instance. 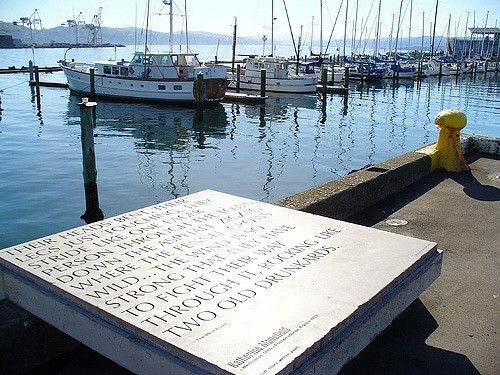 I think what really made me realise was when I lived in New Zealand and fell in love with the Wellington Writers' Walk – a collection of concrete text-sculptures with partial or complete poems or prose on them, scattered in more or less public or out-of-the-way places all around the city's waterfront. 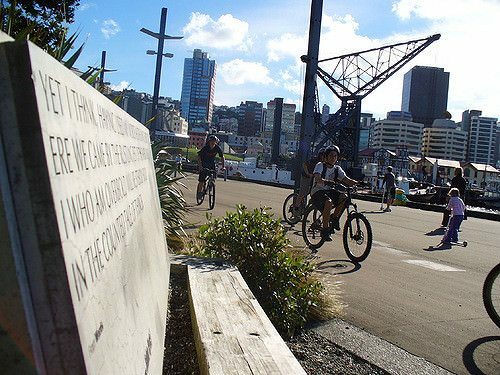 I first came across them a year before I moved there when Billy Connolly rhapsodised about them in his World Tour of New Zealand series, and they were something that made me instinctively know that Welly was a place I wanted to live. Note that last one is both beautiful and practical – it makes a back-rest for a bench by the back wall of the museum. Last edited by Various Artist; 22-06-2018, 11:53. Well the second last is also practical, if you're a duck or a gull. I got arrested while sitting next to that pond, innocently watching the ducks. But that's a story for another day. A bit Frostian, isn't it? (or am I completely off the mark?) (it's a compliment BTW!). Frostian! If only eh? But many thanks. I've forgotten what form the following is in. A ten syllable line, with an extra line on each stanza? I should have made notes. No matter. Like the Owl and Mousehole it's a dream series from adolescence I've been carrying around ever since. No idea why, except that I like the images. At various times I've tried to paint, or photo-montage them but it never works. Always looks too literal and concrete. I'm not sure this is successful either but it's better. by rule of thirds a parallel canal. angled symmetry, a musketeers’ pledge. Against a vermillion wall, more stagecraft. it stabs itself in the brow with a fork. A thin trickle of blood runs down its face. “I’m stabbed in the roots!” the head declares. some alive. Three of them flop to the ground. They slither along the wharf toward me. They grow large. I turn, run down the jetty. the fish rise before me — the size of whales. All times are GMT. This page was generated at 07:47.